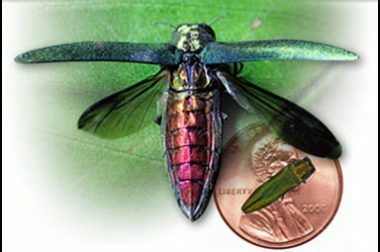 The Emerald Ash Borer (EAB) is an invasive insect that is killing off Wisconsin’s ash trees. EAB was first discovered in Wisconsin in 2008 and has been slowly spreading ever since. In this short video, UW-Madison entomologists Chris Williamson and PJ Liesch demonstrate how homeowners can protect their trees from the emerald ash borer. The treatments shown in the video are annual applications. Once applied, the product protects the tree for roughly a year. Many people choose to make annual spring applications in April or so (right around the time that folks are getting their gardens in order).